Buying a miter saw can greatly improve your home construction or handyman project, because of the numerous features that you can only get with a miter saw, such as angled cuts, and more. There are numerous types of miter saws that are available because there are ways to make certain cuts and depending on your typical project needs, you may not need certain features. 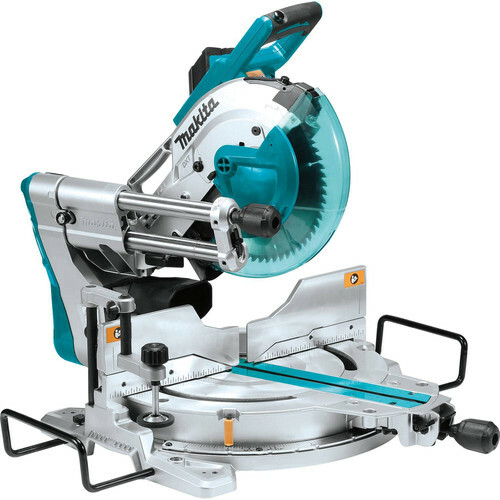 Compound miter saws are one of the most common types of saws purchased because they handle multiple types of cuts as described on this homepage. Therefore, hopefully, this compound miter saw buying guide helps you in picking the right miter saw for your needs. There are specific miter saws which literally only a professional contractor should purchase, because they are the best of the best. If you’re working on home projects, and want something this expensive, you can go for it, but more often than not, you don’t need to blow money on a saw that is a dual bevel sliding miter saw. They also take up a lot of room on your workshop table. However, if you are needing it, you may want to get one of these saws because they tilt in either direction so you can easily shift the bevel of your cut from left to right without having to flip over your wood. Not only that, but you don’t necessarily need a 12-inch blade. If you do, then as mentioned above, feel free to spend the extra money for your business. Most home users are pretty comfortable with a 10-inch compound miter saw because it’s easy to use, and easy to change the blade. These are more popular with DIY projects and you can easily slide it into your corner workshop table so that you can have it ready but out of the way. Ryobi offers one for about $150, which has a laser guide and can easily crosscut a 12-inch board. It also comes with a dust bag to get rid of the hassle of extra sawdust that can get in the way of your cut. There are even more saws though, and the smaller saw you get, the less you’re going to spend. There are even products called miter boxes that actually help you make crosscuts with manual, and more common handheld saws. Of course, you have to buy the handsaw as well. Some people actually like this type because they have ultimate control, and they are extremely accurate, as well as easy to use. Some people choose these for smaller projects and because they like using their hands over electronics more. When buying a compound miter saw, keep in mind there are three types that are most common, and choose the one that fits your needs the most. If you’re okay with having to flip your work piece around for the lower price, just a regular miter compound miter saw can help, as they can cut numerous angles, and also tilt in one direction (usually to the left). Sliding ones allow the saw to move back to front, so if you have wider pieces of wood, you can opt for one of these. Dual bevel is the same as a regular compound miter saw, but its tils in both directions making your job easier. If you want one saw that does literally everything and is larger, then expect to spend the extra money on it.